Well that’s a bummer. 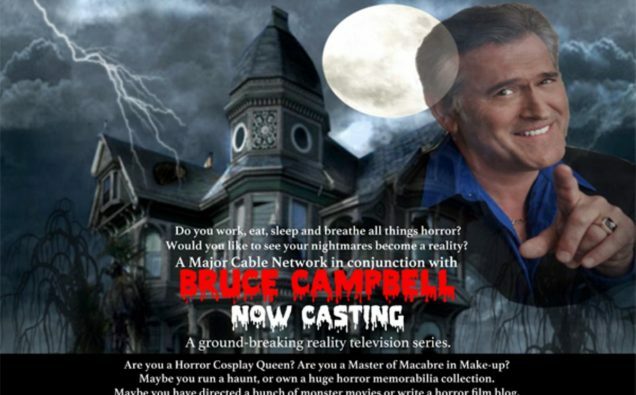 Last December, news broke that a new reality show hosted by horror icon and chosen one Bruce Campbell was looking for contestants. Tentatively called “Bruce Campbell’s Horrified”, the news went viral and pretty much everyone and their dog applied. Do you work, eat, sleep, and breathe all things horror? Would you like to see your nightmares become a reality? Are you a Horror Cosplay Queen? Are you a Master of Macabre in Make-up? Maybe you run a haunt, or own a huge horror memorabilia collection. Maybe you have directed a bunch of monster movies or write a horror film blog. Whatever your passion, if you are a Horror Fanatic and have the credentials to back it up… WE WANT TO MEET YOU! If you love horror, everything considered creepy crawly and wouldn’t be scared to spend a night in a haunted mansion or cursed woods, this project is for you! Tell us all about yourself and why you love everything dark and gory! I myself applied. They even auditioned me and told me they would move me to the next phase. Then I never heard back. Well, it’s July now, 6 months later, and filming was set to be under way already. But, what I kind of figured had happened has now been officially confirmed by none other than the gloriously-chinned mouth of Bruce Campbell himself. TheBlood-Shed writer LAZombieGirl met up with Bruce at The Saturn Awards and interviewed him. I may not know all the behind the scenes workings of a reality show, but I myself am left scratching my head that they started auditioning contestants for something that wasn’t a sure thing… But what do I know? What is clear is that, apparently, it’s not happening. That they auditioned people and then it fell apart isn’t surprising. You need to have people ready to go the moment you are given the green light to start production as shows like this can run on very limited time tables. Shame about the show. I would’ve watched the HELL out of that.